Pantone colour of the year - Ultra Violet 18-3838 is certainly a colour that catches the eye - not to everyone's taste but bold and arresting. Combining the stability and calmness of blue with the passion of red, it is a vibrant and inspiring colour that has been historically associated with royalty, nobility and luxury. Purple's elite status stems from the rarity and cost of the dye - needing a combination of lapis-lazulli (blue) and cochineal (red) and therefore only the rich could afford it, in Britain Elizabeth 1st forbade anyone to wear it except close members of the royal family. Pantone has set the trend for the year ahead with a colour that is beautiful, optimistic and empowering. Today, it is said to symbolise wisdom, creativity and even magic! Colour Psychology - a hot topic in Interiors these days - studies how colours and their combinations affect us emotionally, physically and mentally. Colour is the first thing the brain registers before shape or words or textures. This can be very useful when choosing a palette for your environment. Violet is the colour of spirituality and contemplation and therefore hugely suitable for quiet spaces such as bedrooms or studies. Introduce the colour gradually, consider accessorising and using it as an accent. You could introduce cushions, or lampshades and perhaps a rug with violet in the design. If you feel the colour would be too harsh, it can be softened by shades in the same family of colours such as blues, mauves and pinks. 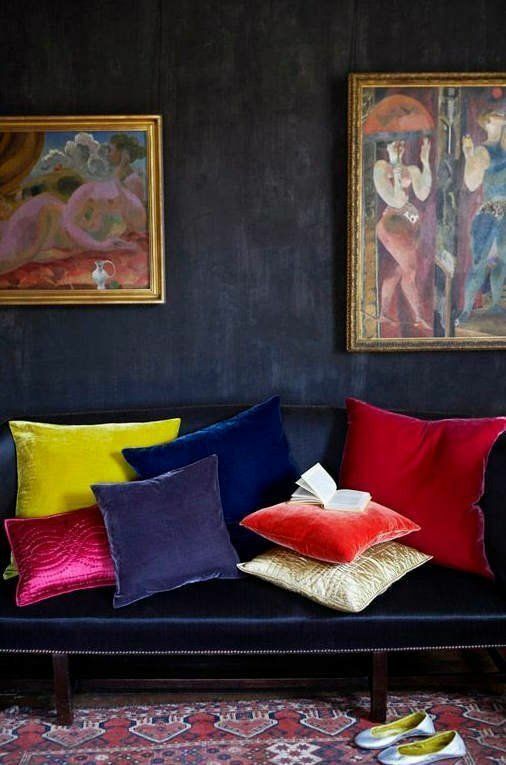 Or you could really go bold and use it alongside other rich, dark colours and opulent fabrics. Go for a large accent piece such as a rich velvet sofa. Suggestions for introducing this hue.
. Feature piece of furniture. Is it a Difficult Colour? This hue is by no means the easiest choice for interiors yet it can work beautifully if you consider the architecture of a room, the distribution of colour using pattern and texture and of course the other colours you choose to combine and complement . Ultra Violet is fresh, exciting, youthful and fun. 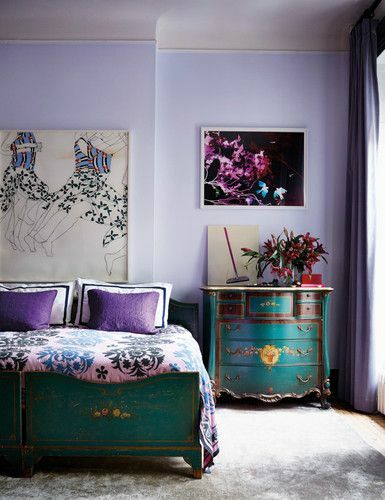 Purple palettes are often chosen for their clamness - warmer than blue and less overwhelming than red. Pastel lavenders, lilacs and mauves are romantic, feminine and pretty. Hazy, smokey purples mixed with greys or earthy browns are calm and effortless especially good when combined with chestnut leather or walnut. Rich plums and aubergines, especially in velvets and silks evoke a lux richness and with touches of gold create completey luxurious interiors. All are timeless and serene. Certainly, purples of every shade are deeply evocative. The positive effects are quality, luxury and enlightenment but it's negative effects are decadence, introspection and inferiority. Eiseman explains, "Because it has both warm and cool temperatures that are inherent in it, it has more versatility than people might think it has." Perfect with greys – which are still hugely popular. 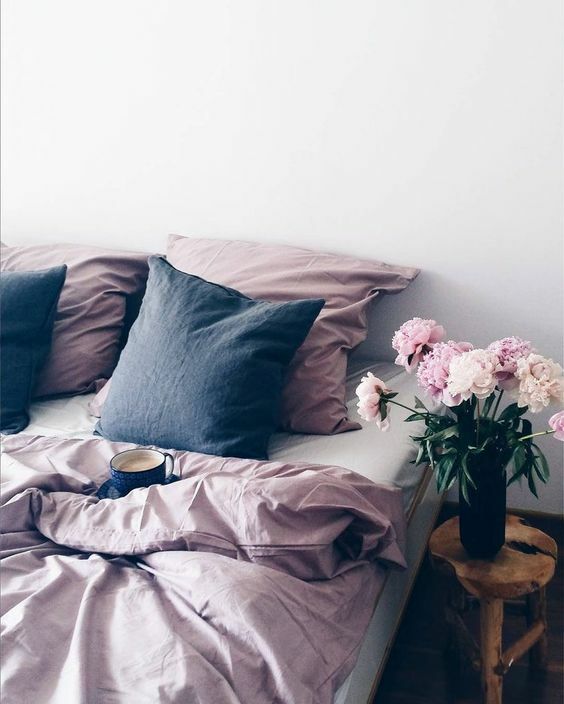 Dulux colour of the year - Heart Wood - is a warm grey/pink that adds a richness to any neutral palette. Yellows of all shades, green of course and oranges for an autumnal feel. "We have created eight different color palettes that feature PANTONE 18-3838 Ultra Violet to help you bring this year's special shade into your designs. All color bases are covered; brights, deeper hues, pastels, mid-tones, and metallics. With Ultra Violet as a versatile trans-seasonal and gender-neutral anchor in every palette, each of the eight palettes conveys its own distinctive feeling and mood and can easily cross-over fashion and accessories, beauty, home interiors, and graphic design applications"
What Effects Does This Colour Have? Soft violet teamed with teal - fabulous comination. Photography by Stephen Kent Johnson. Are you looking to work with an Interior Designer who will inspire and guide you in the use of this enigmatic colour and introduce it to your existing palette? Here at Nicky Percival Interiors, we have a wealth of experience of helping clients visualise their spaces, helping them to explore palettes, combinations and those essential finishing touches, they may not have thought of before. Please get in touch on 07773 372158 or email nicky@nickypercival.co.uk for a without obligation chat.